Cozy Beehive: You can only get better! 0 You can only get better! 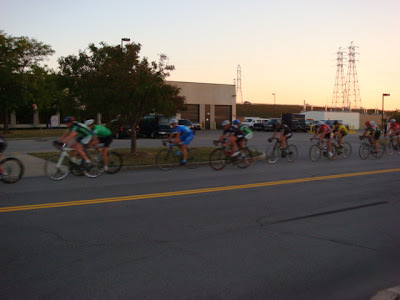 Yes, as long as you keep racing crits, the best races on earth to do! Crits have been a wonderful training opportunity for me. 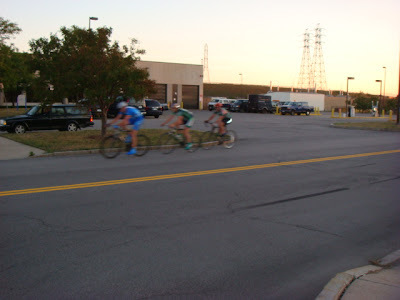 The UB crit is right in my backyard, and racers from all around show up, so there are people of varying abilities. But make no mistake about it. 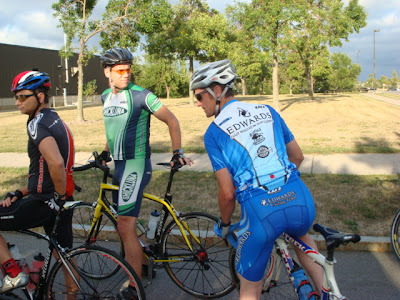 These guys have been racing since their early teens, and they are strong. Guys like me are some of the youngest out there, so I feel awesome when I'm able to stick with the pack. 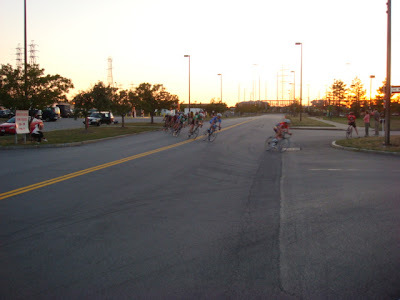 CRIT RACING 101 : How TO NOT END UP CHASING AND BLOWING OUTTTT! 1. Prepare well - Eat and drink plenty before the race. Give it 2-3 days time... If your energy levels are low, don't even bother racing. 4. Check your bike. Lube moving parts, check the headset for play, pump up those tires. Since crits are not usually that long, you're not worried about a high level of comfort, so feel free to pump those tires up to high pressure. This is assuming they are high pressure tires... that can take anything between 105-120 psi. 5. Give yourself a massage, no seriously, if you have embrocation cream, try it. Just 5 minutes will do you good, get some blood going in those legs. The Europeans do this, be like them. This stuff works man. 7. Get to the race course, atleast 30-40 minutes before. This way, you'll have plenty of time to register, meet others, chillax, warm up or plan out your strategy for the day... instead of getting there 15 minutes prior and going about all these things like a madman. 8. Warm up... this doesn't mean you go all out and waste all your energy. 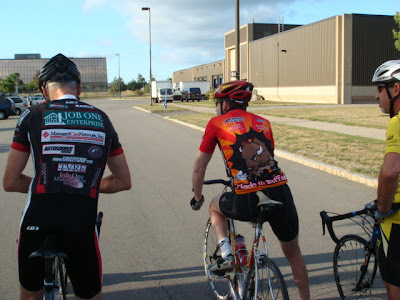 I used to be stupid and waste 20% of what I had reserved for the race just warming up, going 53-13 around the race course. Take the warm up easy man...your body needs to gradually get used to the load. 9. Have a gel before the race. Give it 15 mins or so..
10. Be in the right gear before you start. Big ring up front. 11. Cornering - Lean your body towards the turn, the bike will stay relatively straight, go apex of the turn to outside at speed. 13. 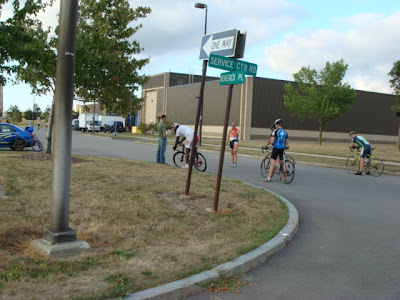 If you're on a corner and want to take it easy, coast and fall back from your right. DON'T BLOCK riders behind you and then cause a pileup. You'll hear plenty of curses, the T-FACTOR is high and racers are animals when they're hauling. You don't meet too many nice people in that situation, trust me. 13. Find your sweet spot. Front is usally better in a crit. 14. Amazing RULE OF THUMB i got from a website, which has become true for me on several occasions. If you have to use your brakes in the corners, you are too far back. It works. AND.... KEEP YOUR HEAD UPPP!!! The guy who works hardest doesn't always win the race (unless they're in a breakaway and it works...) You can do minimum work and still win, I figured this out. Every crit opportunity I get, I try and do things a bit different,to see what works for me. Sometimes I make mistakes. For example, today I thought I was doing a lot of work at the front pushing into the wind, trying to close a gap between me and a rider up front. Once I caught him, I was almost dead!!!! No one pressurizes you to do the pulling. Feel free to fall back and let others do the job. If there is a gap opening between you and the rider up front, take about 5 seconds to go 100% and close that gap as soon as possible. Don't push it beyond that, don't let the gap widen either. Thanks to John for this valuable advice. Yes, I love people giving me advices. Its a good and humbling experience. 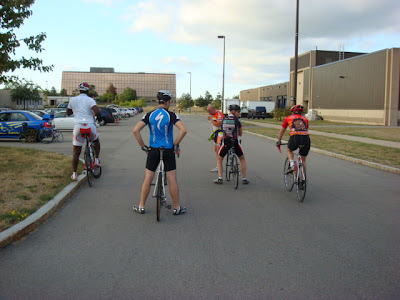 Now to tackle the Niagara Square Crit, which I hear, is going to be a fast fast race.